Even though the list of paradise fruits I've consumed continues to grow--sipping juice right out of the coconut for example ("look like one tourist!" my friend's mother scolds)--a simple, plain, old-time treat still woos my palate. Paradise's flashy fruits and magnificent blossoms could not make this treat look any more plain:  flat, sort of roundish, pale cream colored, hard, not even any scent. I first visited the Big Island of Hawaii in 1996 when I went with my best friend to stay with her parents in the Hilo home where she grew up. When her parents took us to the volcano, we stopped at a little bakery on the way and bought some cookies for later. Nothing suggested that I stood in the presence of the one item that can take me back to the Big Island in full sensory detail with one bite. Later, relaxing in my friend's parents' mint green and white kitchen, feeling the ocean breeze enter the window of the sugar plantation house, my friend's mom made coffee and brought out the cookies. I must have tried to take a bite of the rock-hard treat because I remember her telling me to dunk the cookie in  coffee first...and that was the moment...the Proust moment of cookie and tea that unleashed a multivolume novel of memory...except for me, the cookie and coffee bite preserved a moment of my first visit to Hawaii that comes into full-sensory detail any time I taste the cookie and coffee, no matter where I am. Thirteen years later, as we were all shocked to calculate, I return for my second visit--this time with a husband, the best friend on the mainland and not able to join us. We sit in my friend's parents' kitchen, still mint green and white with ocean breezes. We talk story and eat pineapple. The next day, my husband and I drive to the volcano, but first, we stop in Mt. View, a town of about six still-standing houses, the rest fallen or on the way, and two shops, the Mt. View Video Store and the Mt. 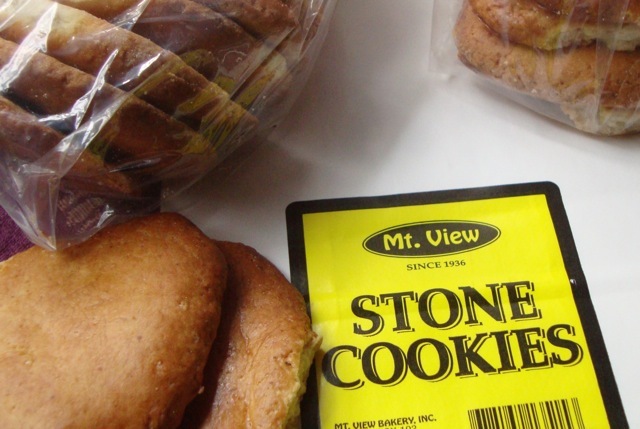 View Bakery--home of the famous Stone Cookie. As the story goes, in 1936, the baker aimed to make one thing, but ended up with the Stone Cookie--a mistake--a hard, flat, almost-white cookie. The bakery clerk compared the stone cookie to a biscotti, but that's ridiculous, like comparing tea sipped in your kitchen to high tea at the Empress Hotel. Stone cookies do not involve the kind of effort or display or variety of biscotti. Incomparable. Three generations later, the bakery and the Stone Cookie still exist, even though the building next to the video store has fallen to rubble. The clerk, unaware of my allegiance to the Stone Cookie, points out the new flavors of coconut, peanut butter, extra crispy, and "old-timer," which bakes less time and is soft for the old faithful whose teeth can't manage the original. I barely hide my immediate rejection of these other cookies as my husband orders a package of "old-timers." I point to the original as if no other option exists. We get three packages but go back today for three more. Amidst the vibrancy, perfume, and flare of lychee, papaya, dragonfruit, the stone cookie offers something elemental, like the striking primordial landscape of the volcano. They're made out of basics anyone can obtain--mostly just flower, water, sugar, shortening. And yet, only one place makes them, and sold in only a few places on the Big Island. Refreshingly hard to find in a Starbucks landscape. The only way to eat them, in my unwavering opinion, is dunked in plain, black coffee, the way my friend's mom taught me to do. Not sweetened coffee, not coffee with soy creamer, not herbal tea (I tried it), just plain, black coffee. I've had three regular coffees since quitting caffeine in April, and I knew this morning would be the fourth exception. While looking out at the volcano rainforest from our bedroom window, I poured maybe 1/2 cup coffee into a mug, dunked the first of my two stone cookies in, soaking it for a good 30 seconds (the fresher they are, the longer to soften), then took a bite. Bitter warmth of coffee meets simple sweetness and solid cookie. I turn the cookie to find the right angle, the most depth to dunk, and soak again, methodically repeating and turning until the whole cookie fits in the mug to dunk. Each bite soothes and warms. I marvel dutifully and genuinely at the twenty-foot tall ferns, the heavy-as-a-bowling-ball banana blossom, the trumpet-sized tulips drooping heavily from branches, and the fact that it all sprouts from lava. But what I really love about Hawaii is how little I need to find happiness and peace:  a towel, some sunscreen, and an adventurous friend who has already scouted out the most beautiful and empty beach; the drip of rain off the giant fern leaves singing me to sleep; and the perfectly accidental ratio of sugar, water, flour, shortening, and heat to dunk in coffee while talking story at the kitchen table.